LATE 40s ROMANIAN POST CARD FOR EDUCATIONAL PURPOSES? Many postal administrations around the globe issued stamps and postal stationery for the specific purpose of training their employees on how to properly handle these items. very well-known are the stamps for training (and testing) issued by the US postal administration. These were never intended to be released to the public or to reach the collectors market, however some examples have surfaced and ended up in private collections. Obviously, most of such items were destroyed after fulfilling their purposes, making the surviving ones extremely desirable for those interested in collecting them. The item illustrated here is apparently a training post card issued by the Romanian postal administration sometime in the late 40s. As one can see, it looks pretty much like all the common post cards issued in Romania at this time. However, there are three striking differences between this post card and the common ones issued by the Soviet imposed Communist regime in the late 40s. First, the post card in discussion is printed on very thin paper, versus cardboard. Secondly, in lieu of an imprinted stamp depicting the People´s Democratic Republic of Romania coat of arms with a face value, there is a square with text that reads "Timbre / 6 LEI" (Stamps / 6 Lei). Six lei was the postal rate for sending a post card within Romania between May 1st 1948 and January 28th 1952, suggesting this "educational post card" (if we can call this item as such) was probably issued sometime between these dates. Thirdly, there is a red overprint diagonally applied that reads "Intrebuintare Scolara!" ("Educational use" as an approximate translation). It seems obvious that such an overprint was not intended for postal usage. 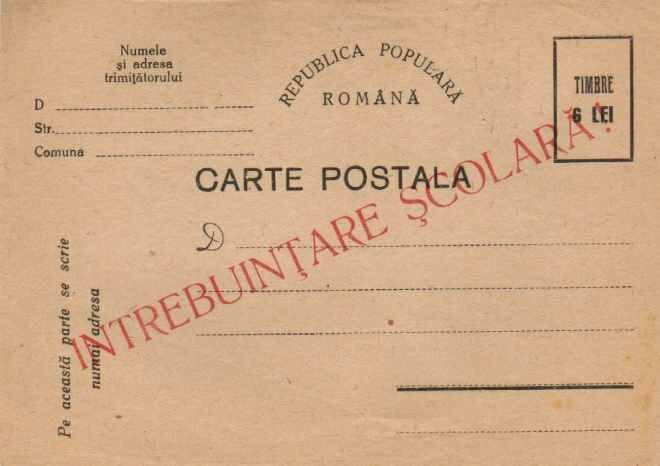 Until other documented opinion are provided the author would suggest that this post card was issued for educational purposes to be used in high schools under the Romanian Postal Administration patronage. Such high schools, where students were prepared to become employees of the Romanian Postal Administration, were common in large cities in Romania during the Communist regime, and perhaps even nowadays. What makes the author of this article believe that this particular post card was in use in such high schools is the presence of the word "Scolara"
(Educational, related to school) in the text of the overprint. If such a postcard would have been used for training of postal employees the presence of the word "Scolara" would have not made any sense. One must not identify the post card illustrated here with such itema as the post cards and picture post cards inscribed "Posta Copiilor" (Childrens Post), part of a very popular kids game in the early 70s bearing the same name. Such items have absolutely nothing in common with the Romanian Postal Administration! However, such items surfaced recently on eBay and moreover, in most cases, they indeed found a buyer! The item illustrated here issued by the Romanian Postal Administration for educational purposes is the only recorded example so far.